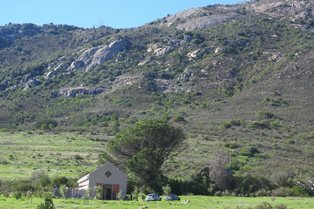 The first ever ringing trip at Fynbos Estate, Paardeberg, was undertaken on 26-27 May 2018. Barry and Sue Schultz, Les Underhill and Dieter Oschadleus spent the weekend in the Black Eagle cottage to ring near the cottage area. 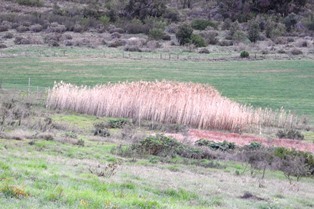 There was a reed patch where weavers roosted and visited during the day, and there was a row of trees and bushes, both areas resulting in a steady flow of birds. The top species for ringing were Cape Weaver (n=62), Cape White-eye (51), and Cape Robin (14). We were surprised at the diversity of species caught: 24 species in total, including all 3 South African mousebirds, 4 weaver species, 2 shrike species and 2 sunbird species. The star species was the Cardinal Woodpecker, with 2 males being caught (surprisingly one was caught in the nets at the reeds!). 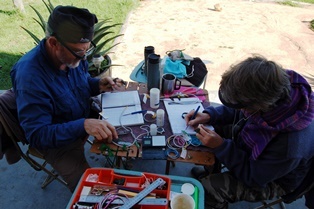 Les put a "moth trap" at night to photogrpah moths for LepiMap. Cape Weavers in the palm tree at the farm house were already building new nests. Thanks to Diana and Johan Simms for a wonderful weekend!